In the present, Huntress and Power Girl, refugees from Earth 2, battle radioactive man Hakkou in Japan. They don’t know what he wants, but suspect he has connections to Apokolips. 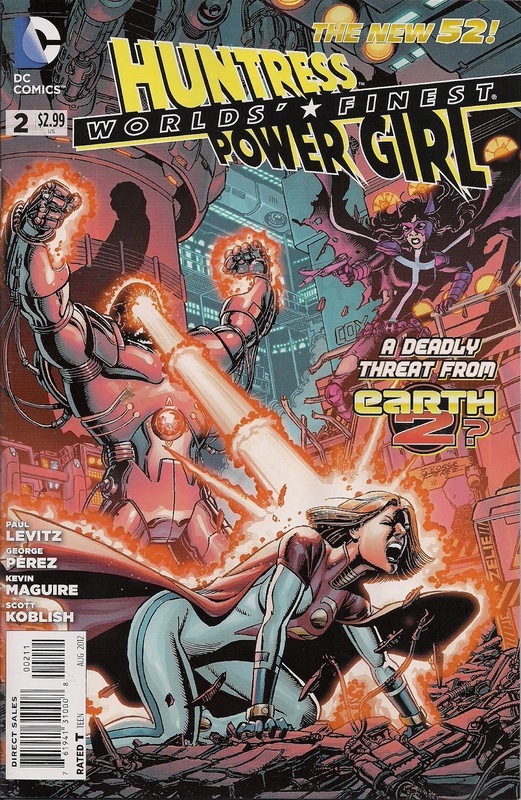 In the past, the heroines put together their new lives on Earth 1, as they conclude that the Darkseid sent packing by the Justice League is the same creature who sent Steppenwolf to raze their homeworld. 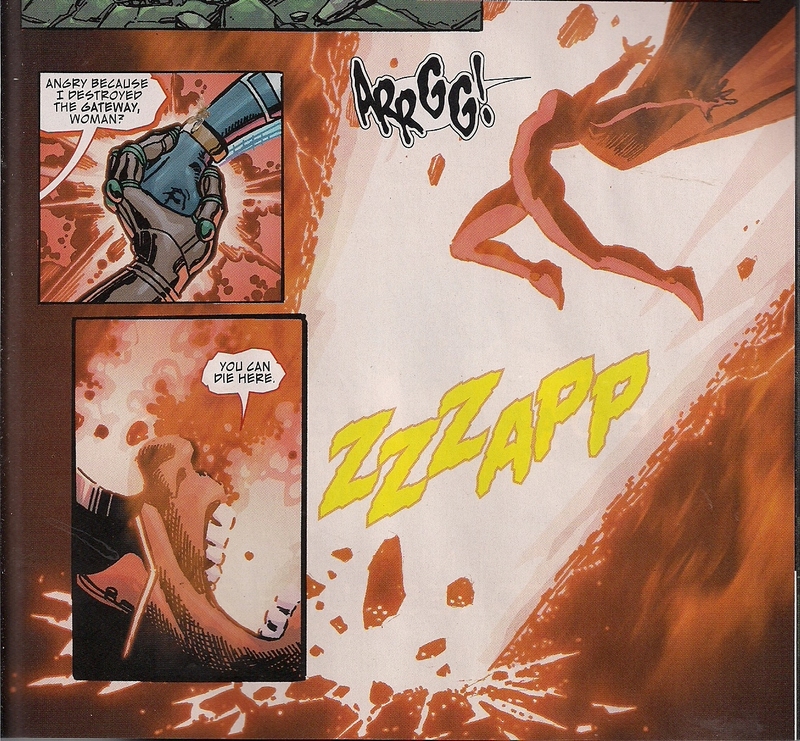 With the likely link to Apokolips, writer Paul Levitz makes the current day portions of this buddy comic as compelling as the flashback sequences. Last issue, it seemed that Hakkou was no more than a throwaway energy baddie, but here he hints that he knows Power Girl, Karen Starr, isn’t from this world. Could it be that the wrecking of Starr Enterprises’ quantum tunnelling generator wasn’t an accident, but sabotage? And because he’s old enough to remember subplots and the concept of added value, Levitz leaves the main action to show us that Huntress’ theft of funds from Wayne Enterprises may not be as untraceable as she thinks. In the past, we see Huntress, Helena Wayne, terribly smug about how easy it is for her to steal from her alt-Earth father, while Karen notes that her ‘body’s not working the same way’. We don’t find out what this comment means, but by cracky, it’s intriguing. As is the indestructible belt that crossed worlds with them – did someone come with it? And would they be friend or foe? While she took an early injection of funds from Helena to set up her business, Karen no longer relies on her pal to bankroll Starr Enterprises. It turns out that some judicious mining makes for quite the fundraiser. And we meet Karen’s trusted associate Somya, as a flashback loops into the recent Huntress mini-series. So, there’s lots going on, but still room for fun, as Karen introduces Helena to the ‘joys’ of playing a meteors video game for real, and the ladies partake of a picnic. It’s heartening how quickly Levitz has gotten into his stride with this book, with the heroines’ friendship front and centre at all times. And courtesy of the two art teams, it looks splendid too. George Perez and Scott Koblish handle the super-villain action scenes in the present, while Kevin Maguire sticks mainly to character work in the ‘five years ago’ sequences. There’s not a page I don’t like, as Perez and Maguire show why they’ve become industry legends. 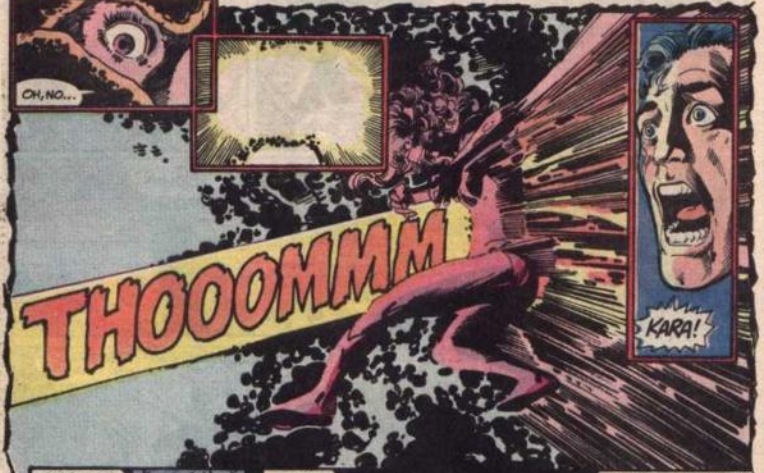 Maguire’s eye for body language and fashion makes his every panel adorable, while the most powerful moment comes from Perez, as a blast hitting Power Girl homages the death of the Silver Age (or ‘real’) Supergirl in Crisis on Infinite Earths. And doesn’t that shot of Hakkou in Perez’s electric cover illo call to mind Supergirl’s killer, the Anti-Monitor? Or am I imagining it all? I don’t know if Huntress and Power Girl will ever make it back to Earth 2, but with issues as good as this set on Earth 1, I’m not sure I want them to. When I saw the cover in the DC Digital Sampler this week my first thought was “Anti-Monitor” too. Nice homages there. *Sigh* My issue didn't come in this week. Now I can't enjoy it like everyone else! It is amazing how we pick up on the same things sometimes Martin. My review is up this morning and I also picked up on the Crisis vibe including a different scan of that scene to compare. I love the friendship of these two because it feels so natural. And it seems more realistic than a Superman/Batman friendship because I don't think these two are as set in stone in their ways. There is some wiggle room. I wonder if Paul asked for this vibe in the character design, or if it's George having fun. Bummer! Hope it arrives soonest. Looking forward to seeing what you say over at Supergirl Comic Box Commentary! I see the Anti-Monitor in Hakkou's silhouette, too. Splendid series…simply splendid. If only all books could be like this. While the friendship between Superman and Batman has always seemed forced to me [very polar-opposite] these two girls are so completely natural; its like we're dropping in on old friends, listening to them talk, I love it. We can forgive Perez his divine indulgences where aping the Anti-Monitor and Supergirl's pre-crisis death are concerned; his art is pure unbridled joy to behold. Ive heard some people say this second ish didnt have much plot to speak of but I disagree; we had tons of action and a sneakily flowing plot that hints and tints at a hidden menace and possibly [ if I feel it right ] an actual purpose behind Karen and Helena being stranded on Earth-2. I used to like the friendship between Hel and Dinah over in the old Birds Of Prey but this relationship is so much more purposeful; a genuine friendship and an effective super-hero duo. I dont htink Ive ever enjoyed a book so much in such a long time. Hey, have you heard…this coming September, DC are bringing out Zero [O] issues of all their 52 titles, with background info on their supposed origins. New Helena feels like the same character, so hopefully fans of Helena B will take to Helena W.
I grew up with the Slver Age World's Finest, so never thought about Superman and Batman's friendship – it just was. It was post-Crisis that mangled my brain, when writers such as John Byrne began insisting that they'd never be friends, as if pals can't be different. I hope the New 52 does show them as friends in more than name. Oh yes, I was refreshing my screen a lot yesterday! [goes and looks for his Amethyst action figure].